Maureen Lockwood speaks about manufacturing as Lori Schaefer-Weaton listens. Iowa manufacturers say they are “constrained” by the available workforce in Iowa and it’s limiting their ability to grow. The current chairwoman of the Iowa Association of Business and Industry’s board of directors says manufacturing is the largest sector in Iowa’s economy — ahead of even agriculture. “You would be amazed to know how many great manufacturing companies actually exist in the state of Iowa. In every corner of our state, in every small town, there’s a manufacturer. Not only as they providing great jobs, but they are contributing to their communities in so many other ways,” says Lori Schaefer-Weaton, the president Agri-Industrial Plastics Company in Fairfield. The governor has declared this the “year of manufacturing” in Iowa. He invited Schaefer-Weaton and other manufacturing executives to his weekly news conference this morning. Maureen Lockwood, the manufacturing manager at Thombert, Incorporated, in Newton, addressed reporters. 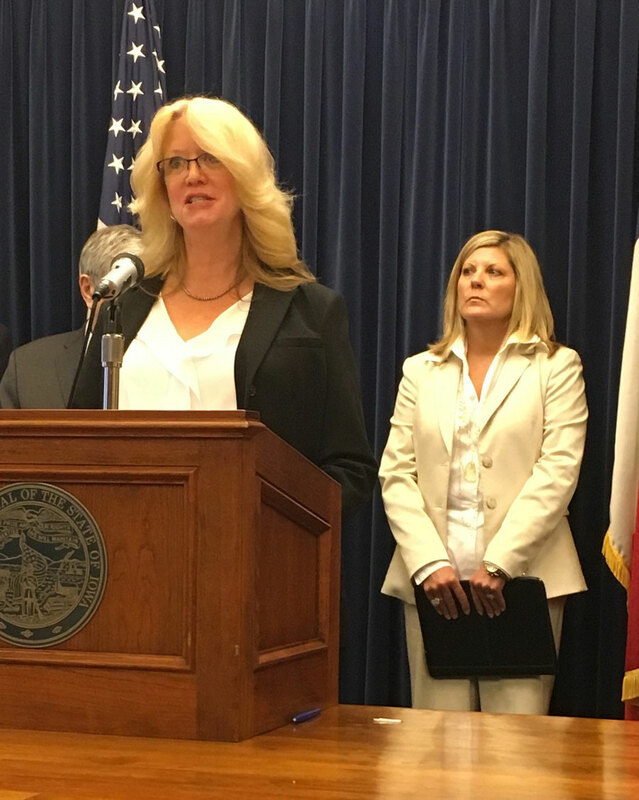 “Iowa’s ‘year of manufacturing’ initiative represents an important step forward for this state in that it will make more companies aware of entities such as CIRAS,” she says. The Center for Industrial Research and Service (CIRAS) is located at Iowa State University. Lockwood says the center helped her company test the wheels and tires it makes for electric forklifts. “CIRAS has helped our company a number of times over the years from polymer lab testing to helping us develop a plan to improve the efficiency of our warehousing,” she says. State officials have developed what they call an “online tool kit” of resources for Iowa manufacturers. According to the governor’s office, Iowa has more than 6100 manufacturers that employ more than 200,000 Iowans. Manufacturing has a $29 billion annual impact on Iowa’s economy. That makes Iowa one of the top 10 manufacturing states.